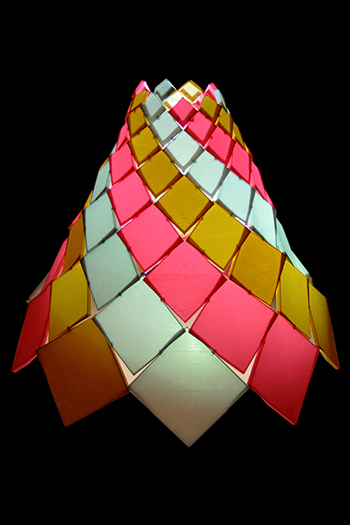 Made of 3D printed components, Spiral Kitty uses the geometry and aggregation of “structural shingles” to produce a lightweight, interlocking, reciprocal assembly: no additional framework, connectors or adhesives were used. This project, designed as a cat shelter, became an opportunity to research the production of an architectonic structure on the bed of a desktop FDM printer. The conical shape comprises nine rows of nine square shingles that diminish in size as they ascend. The shingles overlap and interlock along spiraling trajectories, forming the lines of a reciprocal organization, each shingle supported solely by those around it. Spiral Kitty occupies an interesting space between the 1:1 scale of a full-size, materially performative structure and the abstract scale of an architectural model. We see this digital fabrication and structural research scaling in a variety of ways: larger versions capable of sheltering people or building systems that use these approaches - reciprocity, modularity, interconnectedness - in the realization of efficiencies both economic and material.